The second of two session we dedicate to ‘Soil’ with a selection of texts recommended by Alex Toland, who wrote her PhD on the role of art in the communication and cultural implications of soil conservation issues. 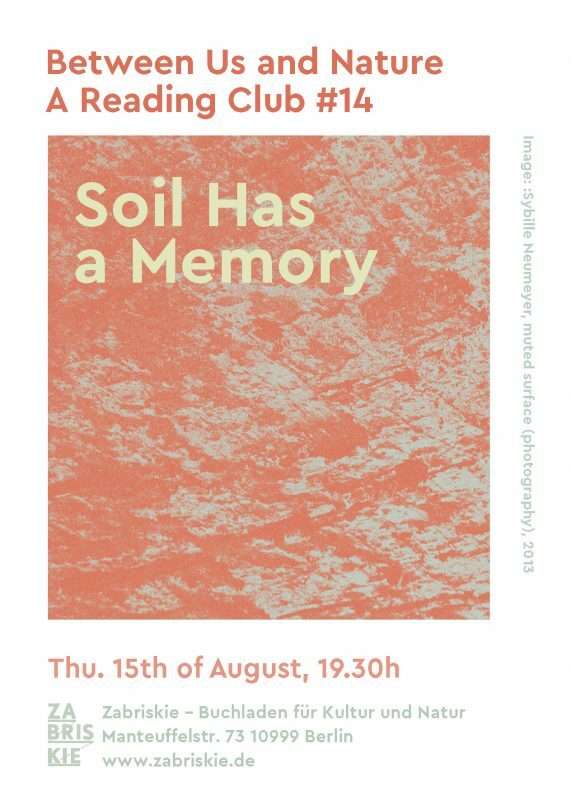 In session #14 we will read more poems, papers and delve into the soil. Technological impact on the pedosphere tends to be long lasting. This is, soil has a memory. If the wake of a boat mars the surface of a river, the effects of the disturbance are transitory. The wake disperses and the river rapidly returns to its original state. But when a plow tills a row of virgin soil, disrupting no larger a volume of material than does the boat cutting through the water, the soil configuration does not quickly, if ever, return to its original state. Soil horizons are overturned or scrambled, and the broken soil, assuming it does not succumb to erosion, retains an enduring memory of its encounter with the steel technology of the plow. The soil records its own history. Without memory, soil would return to its initial state and the passage of the plow would soon be erased, as the ruffled water surface quickly calms and forgets the passage of the boat. Alexandra Toland is a visual artist and landscape planner based in Berlin. She is a co-editor of “ Field to Palette : Dialogues on Soil and Art in the Anthropocene” which is published by Taylor & Francis Ltd (Oct 2018). Hosts: Eva-Fiore Kovacovsky, artist, and Sina Ribak, environmental & cultural manager host the reading club. 1 Quote from Peter K. Haff “The Far Future of Soil” in: The Soil Underfoot: Infinite Possibilities for a Finite Resource, G. Jock Churchman, Edward R. Landa, 2014.